HeatMax 202024 Food Warmer Display, Fits 18" Pizza! New and Improved HeatMax 202024 Countertop Food and Pizza Warmer Display. Keep your delicious food at the ideal hot temperature! 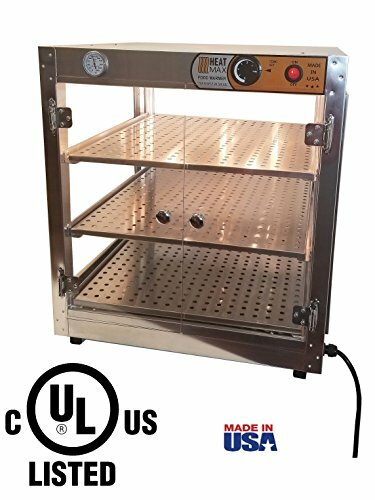 Affordable and reliable Pizza Warmer. Its built out of light weight aluminum with a standard 120 Volt power cord. Plug it in anywhere! Our family has been manufacturing food warmers in Miami Florida for 22 years. We build them, we know them well. Comes with a full 1 year warranty. Parts are available if needed in the future. • Door Clearance is 18.5"
If you have any questions about this product by Heat Max, contact us by completing and submitting the form below. If you are looking for a specif part number, please include it with your message.